Congratulations to the 7th grade volleyball team who defeated Norton in two games 25-12 and 25-11. Brooke Mirka and Emma Gotto led all servers with 8 points each and Ronnie Meinen added 7 points. The girls improve to 13-0. The 8th grade team faced the top team in the PTC and lost 12-25 and 10-25. The volleyball team beat Valley Forge on Saturday 3-0 (25-20, 25-18, 25-13). Junior Ashley Mirka had 22 kills and sophomore Leah Ungashick had 38 assists. Senior Anna Kimevski had 12 digs and 12 service points. The girls are now 13-4 and play at home tonight vs. East. The JV team also won 2-1. The volleyball team defeated Streetsboro last night 3-0, a win that keeps the Comets one game behind Norton for the league lead. 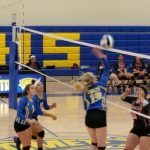 The scores were 25-18, 27-25, 25-20. Junior Ashley Mirka had 19 kills and sophomore Leah Ungashick had 37 assists. Senior Gina Angeletti had 9 digs and senior Anna Kimevski had 11 service points. The volleyball team lost to Manchester last night 3-2 (14-25, 25-23, 23-25, 25-21, 16-14). The girls are now 10-4 on the season and play at home vs. Ravenna tonight. The JV team beat the Panthers 2-1.